If there was an award ceremony for holiday destinations, you’d have to agree that Noosa would claim the title of best all-rounder with its full spectrum of perks. From the white, sandy beaches and lush national parks through to the world-class cafes, bars, and shops; there’s no question why so many beautiful people flock to the northern end of the Sunshine Coast. It’s a holiday planner’s dream and to complete the picture-perfect getaway, wrap your eyes around our cheat-sheet of the best accommodation in Noosa. 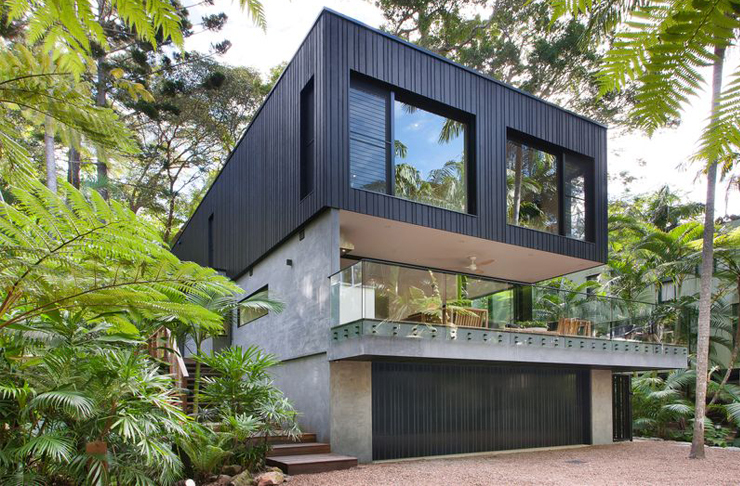 Spend time engulfed within the foliage of Luxury Rainforest Retreat located in Noosa’s Little Cove with all the amenities of a five-star resort, including tennis courts, pool, and an entertainment room with 55-inch TV, X-BOX, air-hockey and billiard table. The three-bedroom property sprawls across three levels and boasts modern design to complement the natural landscape surrounding it. Ensure your stay involves a Noosa National Park hike where 4,000 hectares of native bushland meets the sea, creating plenty of opportunities to relax, exercise or simply just breathe. You’ll be feeling as blissed out as a 100-year old monk following a stay at The Lodge in Noosa Heads, with its ingeniously designed coastal living space. Beckoning a neutral palette, abundant light, lavish plants, cosy linens, and both, local and international touches to fill the gaps, you’ll comfortably sink into life as a Noosa local. Don’t be surprised when every meal is barbecued on the Weber and then devoured on the outdoor deck. The Lodge was created for you to slow down, so do just that and soak up some of the best accommodation in Noosa. If the idea of positioning yourself directly opposite Little Cove Beach in a self-contained two, three or four-bedroom luxury apartment excites you, call off the search party because Little Cove Court is exactly what you’re searching for. This Noosa accommodation comes with all the mod-cons, BBQs, private balconies and plunge pools to feed your holiday appetite. Beyond your apartment, take a dip in the shared heated swimming pool, read a book among the gardens, or cruise on down to Hastings Street for a retail therapy session. Amity House warrants you with the ultimate license to chill with its four-bedroom Queenslander surrounded by the native bushland of Noosa’s hinterland. Large enough for you, plus nine of your besties, across multiple living spaces, generous dining table, wraparound veranda and a yard with fully-fenced pool, you’ll have no reason to leave. This is the place where memories are made, and remember, no day at Amity House is ever complete without a late-night marshmallow-toasting session by the outdoor fire-pit. If you’re on the hunt for the best accommodation in Noosa and think less is more, then Hale Douglas Tiny House in Sunshine Beach, with its retro Hawaiian vibes amongst Noosa’s tropical rainforest, is for you. Tiny in size but huge in character, this miniature piece of architecture built from reclaimed materials features a loft-styled bedroom with skylight, fully functional kitchenette, dining spaces and a nautical styled bathroom. Little Red Barn in Doonan has all the ingredients for a perfect Noosa Hinterland holiday with its incredibly photogenic open-planned barn that sleeps seven guests. There’s a master bedroom with king-sized bed and magazine shoot-worthy ensuite, and for those who didn’t call ‘shotgun’ you’ll hardly be disadvantaged in the equally beautiful queen-sized ground floor bedroom or upstairs loft suite. Farewell the steamy hot summers submerged in the concrete water tank pool, and when winter rolls in, the fireplace will become your new best friend. You’re all familiar with the Sofitel hotel brand for their international portfolio of high-quality hotels with exceptional service, and their Noosa Pacific Resort doesn’t stray from the truth. Located in the main hub of Hastings Street, this Noosa accommodation ensures you’ll always be within reach of the action yet when you’re looking for a place to relax, your room is just steps away. Or, when you’re looking for some more upbeat fun, we can totally vouch for the Euro-styled poolside cabanas; they’ll be your quickest route to self-induced bliss. Ocean views, tropical palms, sun-drenched deck, open-planned living space, BBQ and table space for eight—that’s what you’ll find at this luxe cosmopolitan Sunshine Beach house. Located within a quiet complex of three apartments with direct access to patrolled Sunshine Beach, this is a sophisticatedly-styled Noosa getaway home that you’ll never want to part ways with. If you’re struggling to turn the handle on the front door, we bet the amazing cafes and bars within walking distance will entice you. Start with Sum Yung Guys and Embassy XO. When you want to roll out your door and immediately land upon bustling Hastings Street, or glance out your back window to Noosa’s Main Beach, Tingirana is your number one Noosa accommodation choice. Whilst location is a huge drawcard for Tingirana, the Hamptons-styled suites provide equal satisfaction with their coastally-appointed furnishings and large beachfront balconies. And, for the moments you aren’t keen on getting sand between your toes at Noosa’s Main Beach, the 20-metre pool will gladly take you in. Time spent surrounded by nature does wonders for the soul, so you literally cannot beat the location of Waternest Floating Home directly upon Noosa River. It’s a houseboat anchored alongside a private jetty, featuring all the perks of a non-floating home, including a queen size bed, kitchen, bathroom, breakfast bar and rooftop deck. Rise early with the sun, watch every sunset and fill the space in between cafe-hopping Noosaville’s main street. Doubling as some of the best accommodation in Noosa and the most unique, don’t leave booking this place until the last minute or you’ll be disappointed. Noosa is a feast for the senses, so after you've got your nature fix with a beach day, pull up a chair and taste the goods at one of the best restaurants in Noosa.